Valentin Montanet is the son of Jean Montanet of Domaine de la Cadette, a long-time staple of the Kermit Lynch portfolio. In 2000 his mother, Catherine, and associate Tom Thoden started Domaine Montanet-Thoden, with vineyards inherited from Catherine’s family. After finishing high school, he left his home to studying and work abroad. In 2010 he returned to Vézelay with his mother to take the helm at Domaine Montanet-Thoden. He continues to craft wines according to the natural, traditional approaches established by his mother. The higher proportion of clay in the Montanet-Thoden vineyards gives wines with a bit more structure than those of La Cadette; they are fresh and succulent. 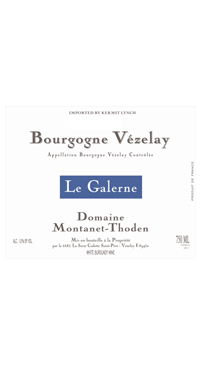 Le “Galerne” is the name of a wind that sweeps down from the northwest across the vineyards of Vézelay, helping the grapes stay dry, cool, and healthy. This Chardonnay grapes are sourced from a 6 ha plot planted in the mid 1990s and early 2000s. Fermentation can last for up to one month for this wine and it is crafted entirely in stainless steel.